HY serial hydraulic buffers are specified buffers with high capacity, remarkable buffering effect and outstanding absorption efficiency. This serial of buffer is able to reduce the inertia impact between two running objects or between running object and stop object. 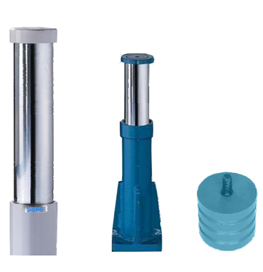 This serial of buffer is designed for the application for heavy duty machineries such as material handling machinery, metallurgical machinery and railway industrial machinery. It will provide excellent damping stop effect for these machineries to avoiding inertia impact during running. With the benefit of the special designed damping holes, which were arranged in proper layout, HY serial buffers provide a stable damping force during the whole buffering process. This will ensure the impact object will be slow‐down smoothly. The most part of the energy generated during the impacting process will be eliminated. Thus, almost no rebound force will occur on the impact object. This will surely avoid the heavy vibration on the buffer shaft. The best shopping cart software by ShopFactory powers D1281. All-in one eCommerce software and shopping cart.